Stock photo of skiers and snowboarders at the base of Whistler Mountain and the Excalibur Gondola Lift, Whistler Village, British Columbia, Canada. Skiers and snowboarders at the base of Whistler Mountain and the Excalibur Gondola Lift, Whistler Village, British Columbia, Canada. 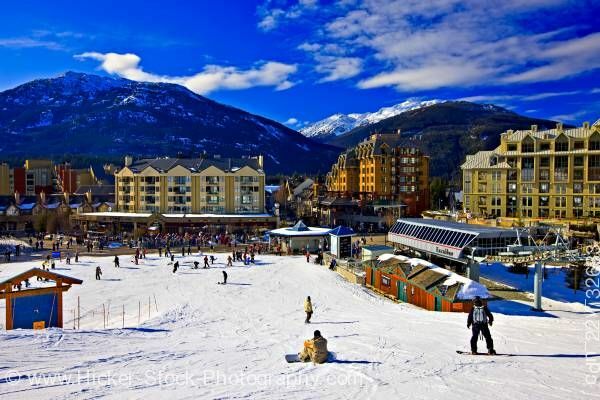 Whistler Village is the hub of the community and was created with the visitor in mind. West Coast architecture mixes with a quaint alpine atmosphere and spectacular mountain views are always in sight. The Village was designed to be a car-free town centre where people could flow like water. Being a strong focal point for the community, the Village has a town hall, fire and police station, medical clinic, museum, library, and more than 200 shops and 90 restaurants. From people-watching to sipping a latte on a patio, there is always something to do in Whistler Village.